Panoramic mountain views! Sit out on one of the three covered decks and let your troubles fade away. Located on the top of My Mountain, this spacious, pet friendly cabin comfortably welcomes up to 10 guests. Relax in the hot tub, enjoy a family game of pool, watch your favorite movie in Dolby-Digital 5.1 surround sound, socialize on the screened in porch, or sit by any one of the six fireplaces and enjoy a good book. 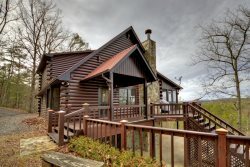 Scenic Rendezview is located just minutes away from Blue Ridge, GA.
Pets OK? Yes, (under 40 pounds), fee applies.